Deborah Noyes is a wonderfully attentive and insightful author and photographer. Melding these two strengths into One Kingdom, she has summarized our oftentimes quirky, odd, abusive, symbiotic, and vastly interesting history living with animals through poetic and quizzical reflections. Her powerful black and white portraits bring to life the animal subjects at hand, out of the printed page and into the forefront our contemplations. 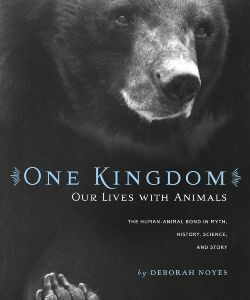 One Kingdom will take you on a global tour of fascinating, timely, and near-and-dear-to-our-hearts subject of human-animal relations. It’s short, accessible chapters make this a wonderful coffee table book. Highly recommended!